Bad planning and development choices don’t just affect their immediate sites and surrounding neighborhoods—their problems take on lives of their own, often outlasting the original use and causing problems for generations. That is especially evident in efforts by the Metropolitan Sewer District (MSD) to stem Louisville’s Combined Sewer Overflow problems all over the city. The underlying problems here didn’t happen overnight. They happened slowly, piece by little piece, over decades. For more than half a century—and to this day—Louisville has made short-sighted decisions about how to grow and develop, paving acre upon acre with impermeable surfaces, mostly surface level parking lots, that service sprawling single-story buildings that add even more impermiable surfaces to the landscape. 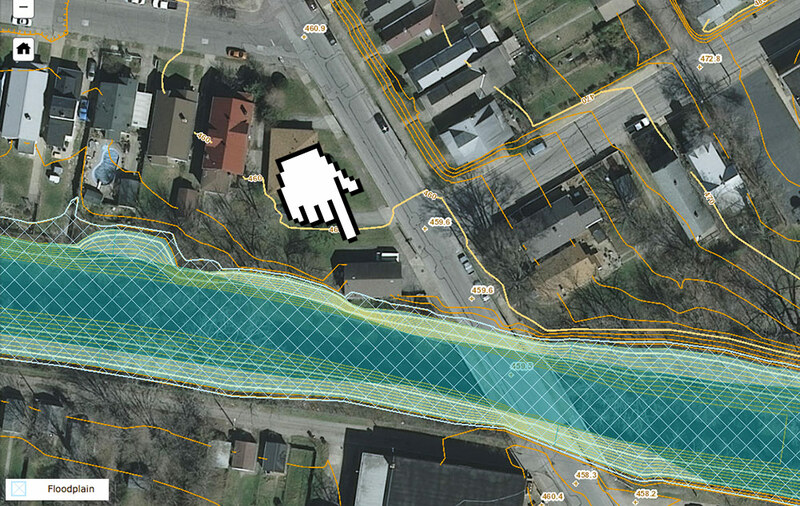 These flat paved expanses don’t just wreak havoc on the city’s walkability, urban character, and neighborhood aesthetics, they create problems “downstream” as rainwater runoff leaves the site, in some cases traveling miles away, and then causes the city’s antique sewer system to overflow, sending raw sewage into local waterways like Beargrass Creek. That hazardous pollution is of great concern, but the problems aren’t over yet. Agencies like MSD all across the country have entered into “consent decrees” with the Environmental Protection Agency (EPA) to solve their CSO problems, and in many cases drastic actions are taken that have consequences beyond fixing the sewers. Currently, MSD is working to tear down 128 houses in the California neighborhood that suffer from flooding partly caused by poor planning of industrial sites in the area. A block away, the city is set to approve a 620-car parking lot for Walmart and the YMCA is building its own 350-car lot. Have we learned anything? In places like Portland, Smoketown, and Irish Hill, MSD is building enormous storage tanks at exorbitant prices that can exceed $50 million and bring blight to the urban streetscape. In essence, this emergency approach to fixing CSO is a little like destroying the city to save it—and brings to mind the heavy-handed approach of urban renewal and highway building decades ago. MSD is doing what it knows how to do to fix a problem it knows has to be solved—and fast. It’s an agency run by engineers who know how to do their jobs—MSD’s business is sewers, not typically placemaking (although this is beginning to slowly change)—but the agency could do well to work with architects, designers, preservationists, and the community at large to create more sympathetic solutions that take place into account. The decisions MSD is making today will be with us for generations to come. Such is the case at 980 Schiller Avenue in the German-Paristown neighborhood. A small wooden commercial building dating to the teens or early ’20s is scheduled for demolition due to a sewer project nearby. Steve W. Emly, chief engineer at MSD, told Broken Sidewalk in an email that “there are improvements planned to a large sewer next to this structure that we determined could not be constructed without placing the structure in jeopardy. Currently, a CSO outfall into the channelized Beargrass Creek runs in front of the building. 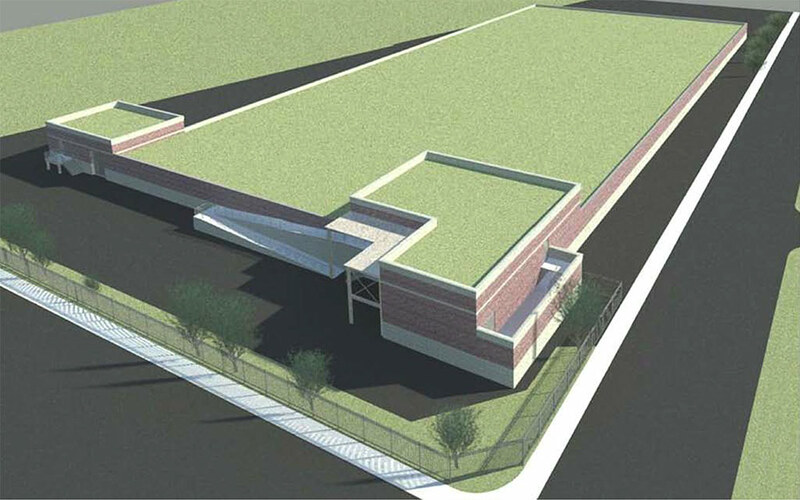 MSD is building an interceptor line to divert the CSO to a massive 84” diameter pipe leading to the Logan Street CSO Storage Basin (pictured above)—the same basin that we mentioned will be deadening the streetscape in Smoketown. But first, MSD wants to get rid of the historic commercial building even though it doesn’t obstruct the project site. The 980 Schiller building previously housed offices for a remodeling company, but MSD purchased the site last November from owner Neal Linker for $110,000, according to a deed provided by Metro Louisville. This type of historic commercial building is exceedingly rare in Louisville and offers an unlikely opportunity for neighborhood retail or affordable office space. And despite sitting right next to the creek, it is out of the flood plain. The structure, in fact, predates the channelization of Beargrass Creek, as the photos above show. If Louisville could undertake such a large engineering project in the 1920s and not disturb this building, then today’s MSD can build their planned project without tearing it down, too. The agency does utility work in urban areas all around town near other historic buildings regularly. Concerns have been raised regarding the structure’s structural stability and effects that blasting and excavation may have upon it. MSD staff visually inspected the property inside and observed that the entire structure is leaning towards the creek. The first floor has a noticeable tilt towards the creek. The basement slab is broken and cracked in multiple locations with some places heaved up into the building. With the building having apparent structural issues it is very likely that construction activities this close to the building would have had additional negative impacts on its condition. MSD believes it is safer and less of a liability to have the building removed prior to construction on CSO 091 than to have concerns of it becoming more unstable during construction. Given the condition of the structure, relocation did not appear to be a practical option. This case reminds me quite a bit of a demolition I reported on about a tiny but unique substation on Armory Place in Downtown Louisville that LG&E wanted to tear down in 2011, also citing “liability” and potential structural issues. The power utility eventually did the right thing and saved the building after public outcry. MSD needs to step up and save 980 Schiller Avenue. It would be a mistake to let the continued problems of the past 60 years destroy the potential of Germantown for the next 60 years. The building is currently in a public notice period about the demolition, which expires on March 19. After that, MSD can tear the building down. A building of this size and materials can EASILY be moved elsewhere . We used to do it fairly often here in Possibility City (smirk)….maybe it could be pasted on to Butchertown Lofts!.. All of these projects have done little more than flatten good land for a maybe scenario – 128 good buildings ! Meanwhile back in the flood plain areas such as off Newburg, no such plans are being made. Breck and Logan is a cruelty joke, when smaller buildings could have been saved along Logan Street. Meanwhile back in planning world, professional zoning and design staff soldiers on, trying to keep CodeSure in the midst of the Clueless Leadership responsible for making back room deals with WalMart, Kindred, Willow Grande, Onni…….. Pay no attention to the manipulation behind the curtains . We’re sustainable! visionary! Green! Thanks for commenting on the predominance of engineering professionals at MSD. . . besides working with the other fields you mentioned to help open up the current existing silo effect, it would be great to see ecologists, geologists, soil scientists, and biologists added to that list. The science fields are vastly under represented at MSD. In the early ’50s this was a little neighborhood grocery store. After the grocery store, this building was a beauty shop in early 60’s. MSD’s “planning” has resulted in a massive assault on urban neighborhoods, and in support of sprawl projects, our eroding non-urban fringe. This aggression is way over the top. Besides the expense, are these the best choices to deal with flooding? We say no. Thanks for your brilliant synopsis of the scope of MSD’s encroachment and why it is not only troubling but self destructive. A major urban city that dumps tons of road salt on its streets is not meeting the Clean Water Act goals, and millions spent on sewer overflow basins will still leave the problems of toxic urban runoff going into the creek. Wholistic thinking was offered in the 1980s when EPA began to study stormwater pollution, but the politicians represented the business sector and shifted pollution control off of individual parking lot owners and onto the general public. As your fine article observes, major parking lots are still approved that dump right into overflowing sewers instead of being required to install green infrastructure on site to mitigate. Thus the cost is shifted to the general rate payer instead of the developer. Engineering fat cats are happy with major projects paid for by ratepayers and big box stores are happy not to have to install GI. The system is reactionary and moves according to these rules to provide infrastructure to support sprawl. The internet has increased the sharing of the truth about how we’re getting screwed -and by who. The next goal is to fashion a united voice informed by sustainability principals and hit the streets and meetings demanding urban planning as if we intended to survive past 2050. Too much is at stake to let politicians pay lip service to urban design principles while remaking the city to permit unlimited waste and inefficiency. While the building is obviously a historic building it doesn’t appear to fit in with others in the neighborhood today from the picture provided. It also looks like extensive work was done to keep it from falling into the construction during the 1920s work that was done next to it. It’s quite possible that the results of the inspection that are noted in the story are true and even if the building was saved today may become unusable in a year or two. Given the facts combined with the fact that it really isn’t in a visible location nor presently being used as a business that benefits the neighborhood may be the best option is to tear it down at this point. Obviously every building can’t be saved and efforts should be put forth to save the ones that are truly worth saving either because of their history, architecture or potential future uses. The biggest culprit and all of this is the Louisville phenomenon that has been happening recently to pave everything in sight! We should have zoning rules in place that require every parking area over a certain size (20 spaces maybe?) should be required to handle their own runoff on-site through various methods. That way the businesses that cause the problems would be responsible for solving them on their own dime instead of using the taxpayer’s pockets to solve the problems. A photo of Steinmetz grocery taken around 1957 has been posted by a reader on the Germantown – Schnitzelburg facebook page. Is there any option to comment or otherwise act during this “public notice period”? Steinmetz Market was constructed in 1918, I think. At least that is the year that the Steinmetz family moved into their new home around the corner at 1078 Highland Avenue, from their previous home above their previous grocery store on Logan Street. The owner was my maternal grandfather, John G. Steinmetz, who also owned the lot at the corner of Highland and Schiller. It was a grand yard to play in until he sold it to the builder of the duplex that is now beside the store building.